One of the great uses for the iPad in the Art Room is the combination of Art and Literacy. Several apps allow students to use their own art or photos as inspiration for writing. This can be a simple few words added to images, or poems, or even digital storytelling. Phonto lets you add text to any image. Student artwork or photos can be enhance with creative writing or even simple vocabulary words. Lots of font choices and text can be added anywhere and customized. Phonto is Free but you can get rid of the ads for $.99. Phoster is an excellent app to use for graphic design projects. Have students combine their artwork with writing. Below is an example of art combined with poetry. Ransom Letters lets student add ransom type cut out letters to their artwork or photos. What better way to encourage students to include writing in their art. This app is an affordable $.99. The image below is a painting created using SketchBook Express with words added in Ransom Letters. the words become part of the artwork. With TypeDrawing - your lines are made up of customizable words. Students use literacy skills as they draw - The best of both worlds! There is a free TypeDrawing app that you can try out. The iPhone version is $1.99 and the iPad version is $2.99. This may seem like a bit much -but it is well worth it to get the full iPad version. Below is an example of a TypeDrawing work of art. This free app can be used in the same way as TypeDrawing. WordFoto takes photos or images of artwork and applies words to it. The words and phrases can be customized and different styles applied. WordFoto has been used on the two artworks below. 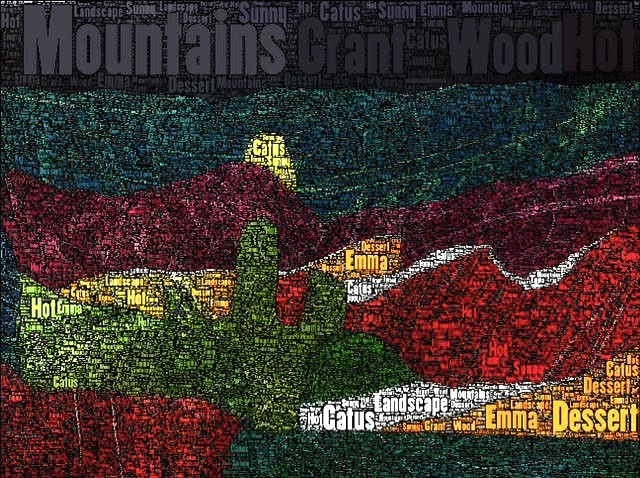 Below is an example of how the WordFoto app can be used by students. 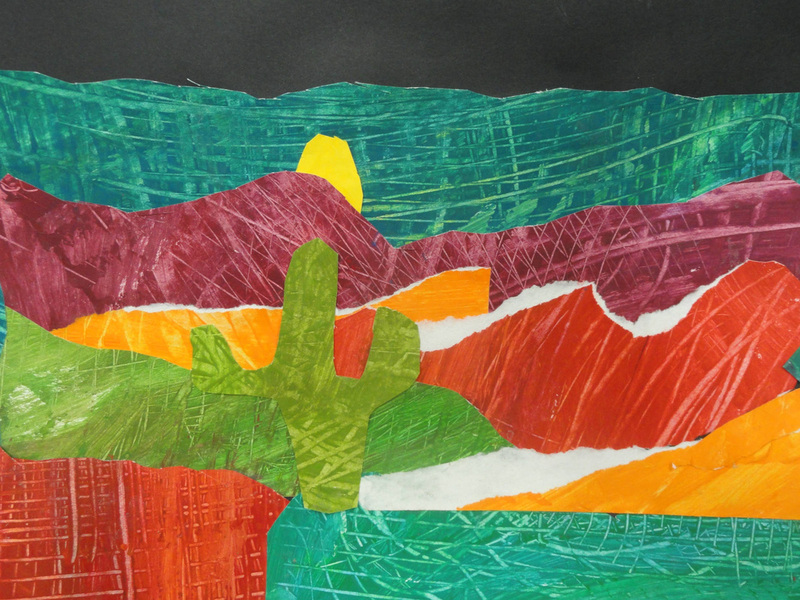 The image on the left is a landscape collage and the one on the right show how the student incorporated words into their artwork. Click on the image on the right to see more student works in Artsonia. Teach Digital Storytelling by combining photography, graphic manipulation, and writing and literacy skills. Books can be printed and/or sent to others as a PDF file within app. The video below was created by 5th grade students at Brunswick Acres Elementary School in South Brunswick, N.J.
Just Another Ordinary Day at the Toilet Park from Suzanne Tiedemann on Vimeo. Toontastic is an amazing free app that allows students to create fun digital stories. There are scenes, characters, and music to choose from to use or students can draw their own. Students narrate the story with their own voices. Once created the finished product can be uploaded to ToonTube and shared. Toontastic would be great for a cooperative project! It allows you to create beautiful books on the iPad. Students could use artwork images, photos, and text to create a book. These can be read in iBooks, shared using a PDF file or even submitted to iBookstore. The example on the right is pages from a collaborative class book inspired by Faith Ringgold's storyquilts.